Inspired Leadership is a unique experience that communicates the Four Stars of Leadership exhibited in the life of General Tommy Franks: Character, Communication, Common Vision and Caring. Each session engages participants through illustrations, videos, worksheets, activities, and interactive content which heighten each participant’s ability to learn and retain practical leadership principles. The Inspired Leadership Experience is a 2–4 hour workshop that combines historical facts, leadership principles, interactive activities and vivid illustrations that will provide the participant with a comprehensive view of General Franks’ applied leadership style and will assist in the discovery of the participant’s leadership potential. It will also include interactive components that will provide each participant with action steps to apply the leadership principles immediately. Inspired Leadership Keynote presentations are based on select principles of the full experience geared towards a business audience in order to address specific leadership goals. These presentations generally range from 45-90 minutes in length. "'Inspired Leadership' was the perfect message for my leaders to take back to their units." How do I schedule an Inspired Leadership Experience? For scheduling information please fill out the online booking form and we will be in touch. 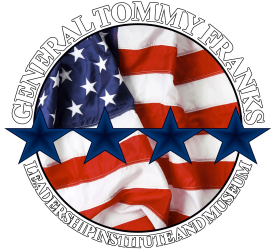 Please call (580) 726-5900 or e-mail admin@tommyfranksmuseum.org for more information.